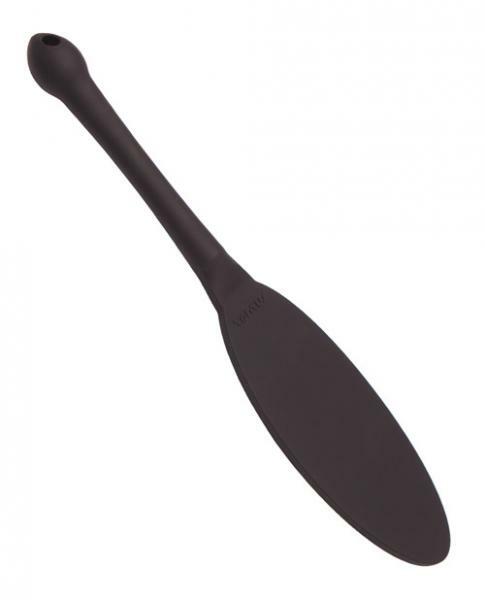 Introducing the new Tantus Gen Paddle, a versatile silicone paddle for getting into tight spaces. The thin stingy surface it precise in its bite and it moves effortlessly never hurting the handlers wrist. Its perfect for genital and targeted impact as well as good all around play. Invert the paddle and the handle gives a nice thuddy hit. The rest of the handle offers up 7 inches of insertable length so you can be a platypus or a beaver. Silicone is perfect for impact play. It transmits energy like no other material. Its durable and you can hygienically clean it. It is safe to use after cleaning with multiple partners. The Gen Paddle is 12.5 inches in length allowing close intimate play and ultimate control on a partners sensual experience. The 7 inches handle has a comfortable egg to hold at the end and is safe for insertion with a personal lubricant. Safe for your body: made from Tantus own unique formula of 100% Ultra Premium Silicone. Easy to clean. Eco-friendly, hypoallergenic, hygienic, boilable, bleachable and dishwasher safe. Insertable length 6.75 inches, handle diameter 0.53 inch, handle width 0.4 inch. Tongue length 6.5 inches, width 2.5 inches. Total length 12.5 inches. Tantus silicone toys are handmade, hand poured, and artistic in nature. Small imperfections and variation in color, texture, density, and size are inherent in the product and are not considered defects. Sizes may vary 5% smaller or larger than the listed dimensions.